August 6, 2018 – BOSTON – Slone Partners, North America’s leading executive search firm for life sciences and diagnostics companies, announces the placement of Dr. Paul Harney as President, North America at Prescient Healthcare Group. Dr. Harney will be responsible for delivering Prescient’s North America growth strategy and enhancing client satisfaction. He was also named to Prescient’s Board of Directors. Founded in 2007, Prescient is a leading biopharmaceutical product and portfolio strategy firm, offering evidence-based decision support for life sciences companies in the areas of commercial planning, strategy, marketing and analytics. Prescient counts 22 of the top 25 multinational pharmaceutical companies as clients, has completed more than 600 engagements in 11 years and is a portfolio company of Baird Capital. Dr. Harney has more than 20 years of consulting and leadership experience providing guidance and support to the healthcare industry and has worked at Deloitte Consulting and IQVIA (formerly Quintiles). His areas of expertise include business development, marketing, field force optimization, supply chain maximization and medical affairs. Dr. Harney earned his PhD in chemistry from New York’s Stony Brook University. 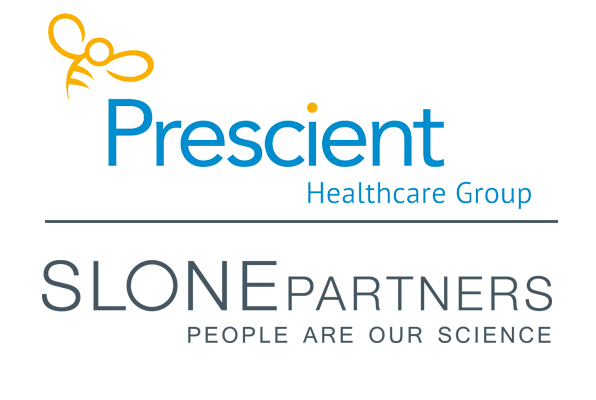 Slone Partners delivers the leaders who build amazing scientific healthcare organizations – People Are Our Science®. Since 2000, Slone Partners specializes in delivering world-class C-suite leadership, executive and upper management talent to the most promising and established life sciences, diagnostics, precision medicine, CRO and laboratory services companies. With coast-to-coast presence in the most active healthcare industry hubs of Boston, New York, San Francisco, Los Angeles, San Diego, Austin, Research Triangle Park, NC, and Washington, DC, Slone Partners uniquely and precisely provides an array of executive search and advisory services to innovative scientific healthcare companies. To learn more about Slone Partners’ value proposition and processes, visit www.slonepartners.com or call 888.784.3422. Prescient Healthcare Group is a biopharmaceutical product and portfolio strategy firm that helps clients develop, launch and market medicines that expand treatment options, optimize patient outcomes and deliver high levels of return. From offices in London, New York, San Francisco, New Delhi and Beijing, Prescient supports the development of strategy for many of the most exciting assets and brands. Prescient has been a portfolio company of Baird Capital since 2017. For more information, please visit www.PrescientHG.com.